If you’d asked me as little as four years ago what I thought of the 996 Carrera design language, I might have spit on the ground and cursed its mother. As we age we gain wisdom, though, right? I’ve recently come around to the unfettered and quite handsome bodywork of the 996. And I’m not just talking about the wide hip Turbo and Carrera 4S, or the extra special sauce GT3. 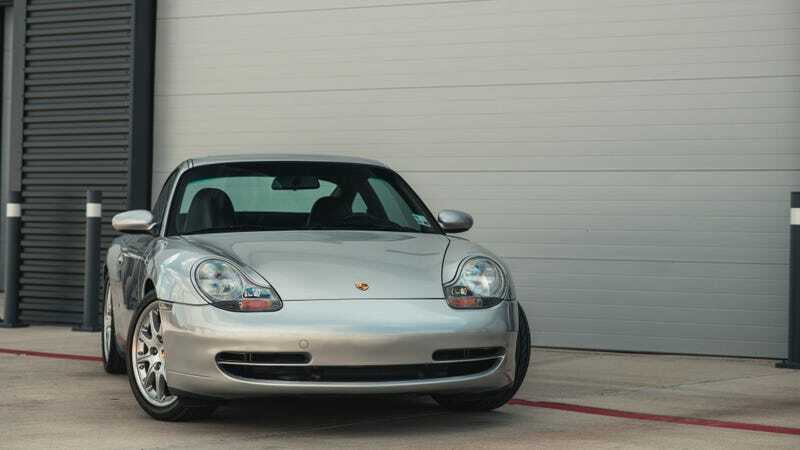 No, the bare bones 996 Carrera 2 is rapidly becoming my favorite Porsche design. Porsche was in dire straits in the late 1990s, and needed a car to turn the company around. In studying Toyota’s manufacturing processes, Porsche effectively replaced the 993-generation 911 and the lower-tier 968 sports car with a pair of cars forged from the same design. The new entry-level Boxster and the new top-of-the-line 996 shared the same design language, and many of the same parts. In fact, the 986 Boxster and 996 Carrera 2 are virtually identical from the driver’s seat forward. This part sharing allowed Porsche to focus on profitability, and build both cars to a price point. Every year since the introduction of the Boxster and 996, Porsche has turned a profit and grown larger. This car was a turning point for Porsche, not just because it was built by an ever increasing number of robots rather than hand-assembled by fallible humans. Quality of materials used diminished to meet that price po, but fit and quality of assembly improved. All of this backstory is to provide some context for the design turned out by Pinky Lai under a Harm Lagaay-run Porsche design studio. The company needed a clean sheet design that maintained Porsche’s connection to the past while modernizing and updating manufacturing standards. The 996 is what popped out. Where the 993 was still an update of a body that had been in production since 1964, the 996 was the new hotness. The narrow body Carrera 2 and Carrera 4 are my favorite of the 996 generation designs, because it’s such a pure expression of a modern take on a classic shape. It retains Porsche’s iconic silhouette while making it look lower, thinner, and sportier at the same time. Yes, the “fried egg” headlamps are a bridge too far for some, but a brushstroke of weirdness is welcome on a sports car if you ask me. And if you’re blessed with the hindsight that we now have, you can’t tell me this headlight looks worse than anything McLaren has used for the last half decade. With the angry faces we’re subjected to on cars today, the egg lamp hate has faded from my soul and sometimes it’s okay to admit your opinion has changed about something. Is the 996 body style the perfect Porsche? Well, the interior is a plasticky hellscape letdown, and the engine isn’t quite as reliable as the previous aircooled motors, or as reliable as the direct-injection engines that followed in 2008. That said, it loves to rev, it’s still an incredibly analog driving experience, and in my opinion it looks good. Most importantly the 996 is a vastly improved driving experience over the 993 that came before. While some in the Porsche faithful would have me burned at the stake for such blasphemes against the aircooled deity, it’s the truth. The 996 is more nimble, handles its weight balance better, more powerful, more sonorous, and ergonomically improved. You can daily drive a 996 much more easily than you can a 993, for certain. For the prices these are currently selling, they’re a bargain pure sports driving experience. Buy one. Even if you don’t think they are pretty, at least you don’t have to look at it from the driver’s seat. The 996 is good, y’all. This particular car is currently available for bidding on Bring A Trailer with no reserve. Is The Porsche 996 Motor A Pin-less Grenade?